Take a step back in time and explore San Diego aboard everything from steam locomotives to exquisite model train exhibits to coastal views to die for. View from the second story seating on North County’s Coaster from Oceanside to San Diego. 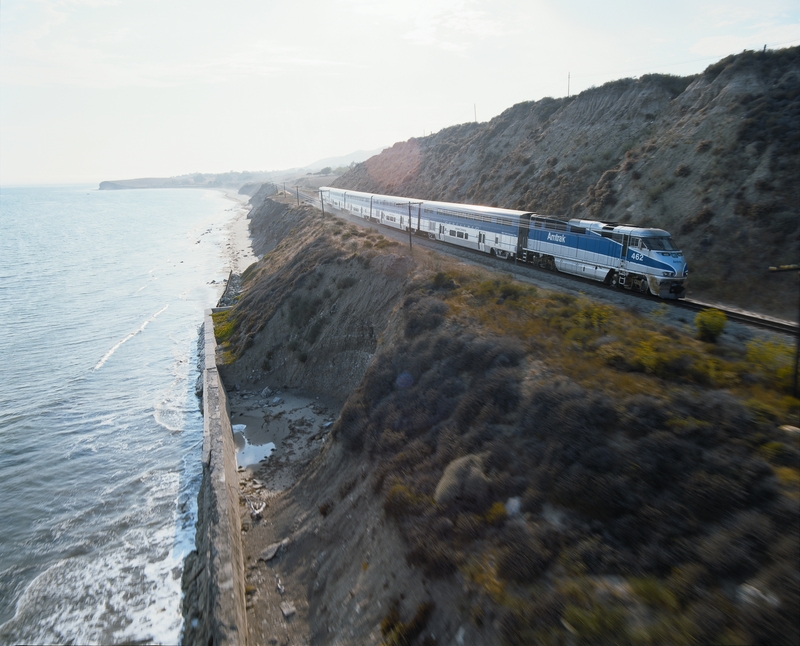 Visitors to San Diego County can ride the rails on double-decker Coaster and Amtrak California trains along the coast with not-to-be-missed views of the ocean. 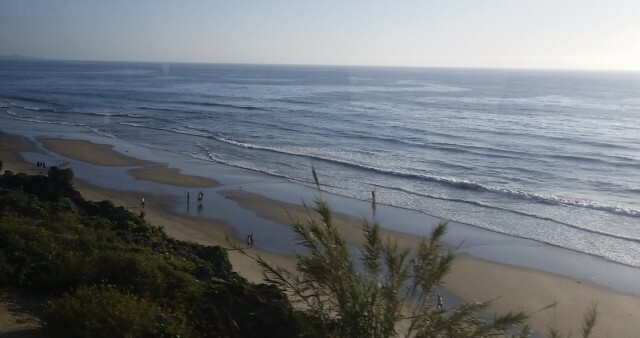 The trains also travel through seaside surf towns like Encinitas and intersect the Pacific Ocean and Del Mar Race Track and fairgrounds (“where the turf meets the surf”) on each side of the train, making taking San Diego’s “commuter” trains vacation-worthy excursions. Once in the city, visit the San Diego Model Railroad Museum (SDMRM) in Balboa Park. The world’s largest operating model railroad museum, this unique venue contains four enormous scale and model layouts that will delight young and old with their accurate and playful re-creation of famous railways throughout the southwest. In addition, the museum features a Toy Train Gallery with an interactive Lionel layout for children, and seasonal visiting exhibits, such as the John D. Spreckels: Building San Diego’s Crown Jewel exhibit currently on display. Balboa Park is celebrating its 100th Anniversary this year and the SDMRM is creating a 2015 Centennial Railroad Garden to be unveiled in late April. 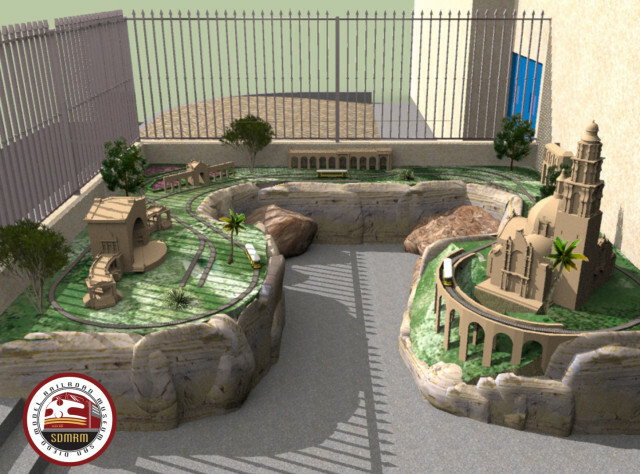 This open-air model railroad features a miniature recreation of Balboa Park as it existed in 1915 and showcases new technology that enables visitors to interact with the layout directly by using a smart phone or tablet. If you want to actually ride in vintage trains, opportunities abound. 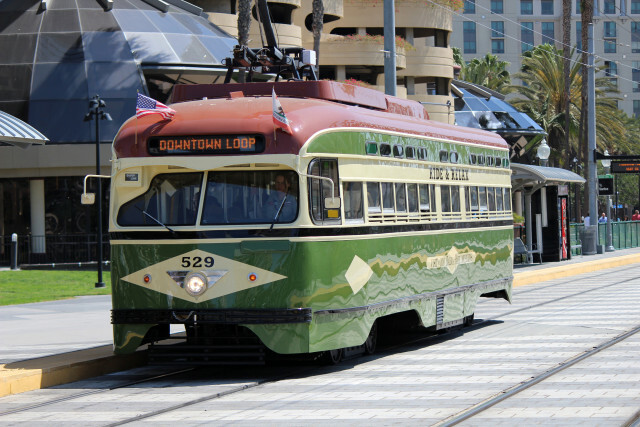 Even our city trolley system has a restored green 1946 vintage car on the tracks running limited service on a downtown loop among the modern red trolley cars. My daughter rides the rails at a train-themed birthday party at Old Poway Park. Family fun can be had at Old Poway Park where the Poway Midland Railroad offers weekend rides on various vintage trains, including an original steam locomotive, a speeder and a trolley depending on the weekend and season. The park plays host to many community events and festivals year round and is a great place to bring a picnic. All aboard the PSRM’s Golden State Limited Train! 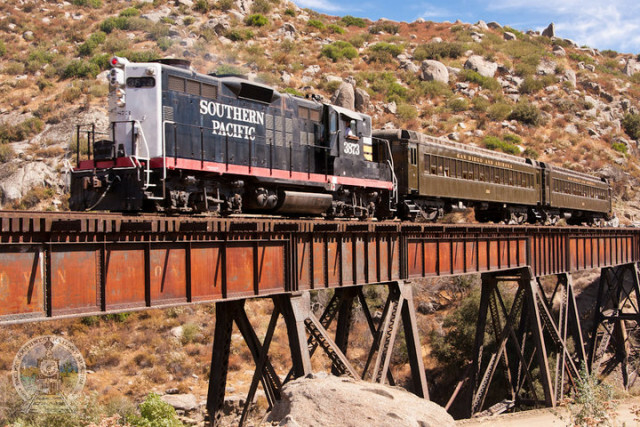 A trip to Campo in San Diego’s southeastern regions lets visitors experience the Old West at the Pacific Southwest Railway Museum. The 40-acre interpretive museum at Campo and a small satellite museum in downtown La Mesa educate visitors about the rich history of rail travel in the U.S. At the Campo venue, PSRM operates real, old-time trains on 14 miles of the mountainous San Diego & Arizona Eastern Railway, a historic rail line built by John D. Spreckels in the early decades of the 20th century. 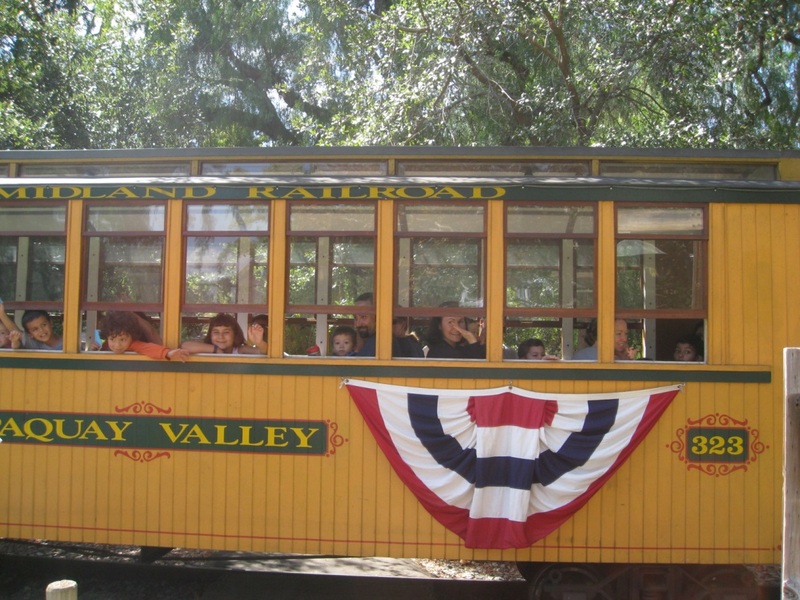 Passengers can take weekend, select Tuesday, and seasonal rides aboard the Golden State Limited locomotive during a one hour round trip train ride on the historic railway. The PSRM offers special event excursions for private groups, school field trips and seasonal rides such as “The Bunny Train” and “The Polar Express” during the winter holidays, offering rides to The North Pole to visit Santa. And finally, if you are interested in buying vintage model trains, San Diego’s Frank the Train Man retail store opened in 1943 and is still going strong in its current North Park location. Or if you’d like to sip one of San Diego’s famous craft beers while sitting in an old trolley stop, check out Station Tavern for a burger and a family friendly play area that includes a model trolley car for the kids to play on. The site was originally a trolley station for San Diego’s No. 2 line from 1929-1948. Make your last stop The Whistle Stop Bar, a hangout for locals that dubs itself “the little bar that could” and is only a few steps away from Station Tavern. This entry was posted in Attractions and tagged balboa park, downtown, east county, north county inland by Sarah Weinberg. Bookmark the permalink.